Here you’ll find a detailed description of all the settings for Patches found in the Properties panel. position, adjust the value to the left or drag on the center arrow in the patch element. FoV – The area the patch image covers. Scroll up and down to zoom in and out, creating a narrow or wide image. Aspect Ratio – Enter the desired aspect ratio to change the dimensions of the patch. The default is 1:1 (1.00). Apply after leveling – This setting is best used for Droplets and the Master Node. When the down or up faces are not located at -90º or 90º after leveling (e.g. drone/helicopter shots, one-shot cameras not on a tripod, etc. ), you can select this setting to make sure, for example, that your logo (patch) always stays on the down or up face even after leveling is applied. Lock Position – Select to lock the patch’s position to avoid accidental movement. The blurred patches are useful for the images being submitted to Google Street View; for blurring faces, license plates and covering the tripod. When you choose one of the burred options, you will see an Intensity slider. Use this to adjust the amount of blur. Format – Available when Type is set to Image. Choose the patch’s output format – PNG, TIFF, JPEG, PSD, HDR. ★ Tip: You can right-click the image format and choose Set As Default, to set the current format as the default for future use. Image Quality – The JPEG quality of the image. File – Name the patch here or open a new version of a patch. Extract – Click to extract the patch. The patch will open in your default photo editor. 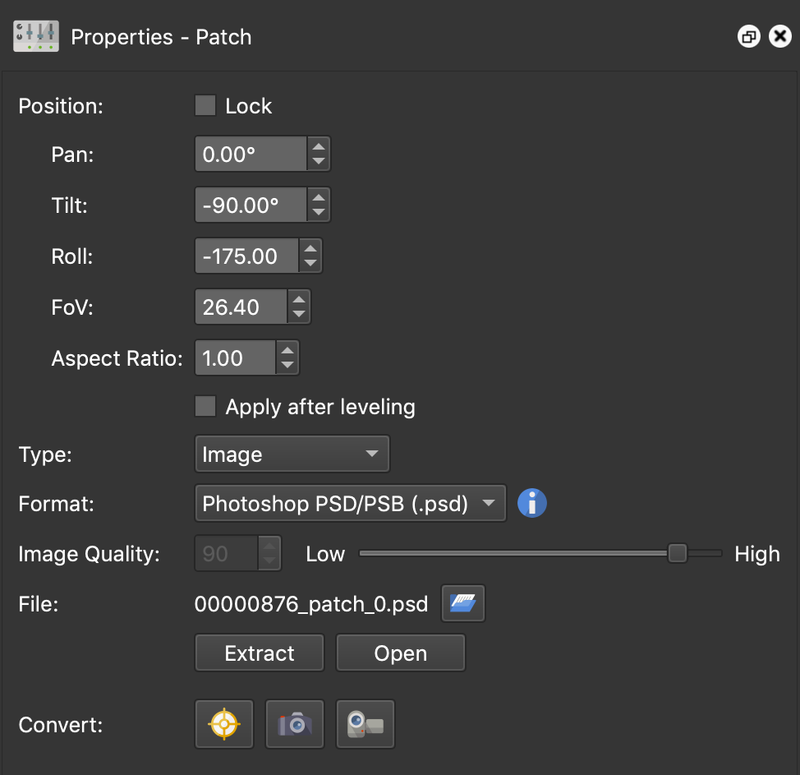 Open – Click to open the patch image in the default program you’ve set for image files.